We had encountered various official videos and other performances by Waxahatchee, but hadn’t been able to get beyond the bluster. 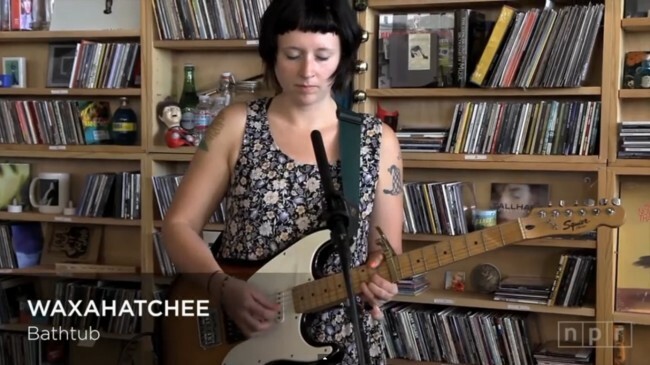 So we were pleasantly surprised by the band’s (here, essentially Katie Crutchfield) just-released Tiny Desk Concert from NPR. The solo acoustic setting finally enabled us to parse her well-formed verses and hear the worth of the songs. You will be seeing them on lots of Best Albums of 2013 lists for their second album, Cerulean Salt. Consider this a soft introduction to the band as we continue to wrap our ears around their music. To get a feel for the full-band versions of their songs, after the Tiny Desk Concert check out the official video for their song Misery Over Dispute, followed by NPR’s capture of their live SXSW set earlier this year.